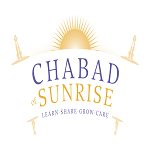 Chabad of Sunrise endeavors to provide meaningful and inspiring Jewish experiences, a loving home for the Jewish community and opportunities for Jews of all levels of observance and experience to promote their spiritual growth, community growth and Jewish identity. Chabad also endeavors to promote humanitarian causes and educational experiences for people from all walks of life. As a growing branch of the international Chabad-Lubavitch movement, our goal is to provide a warm, loving and welcoming environment for meaningful and joyful participation in the full spectrum of traditional Jewish life. We also promote humanitarian and educational causes for people of all walks of life.